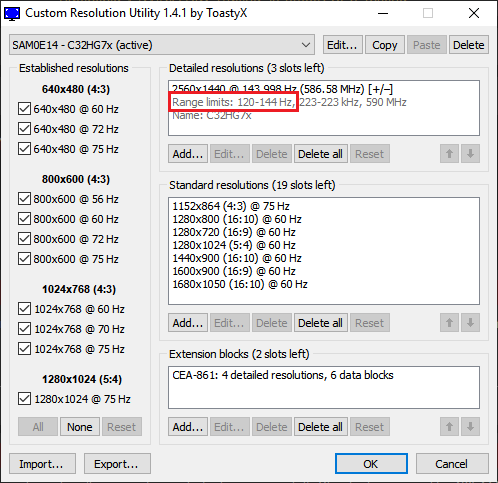 Anybody with a Samsung C-series (CHx/CFx) experiencing flickering with FreeSync Ultimate Engine? Discussion in 'Displays' started by viivo, Jan 19, 2019. C32HG70 here. It did it when I used FreeSync on a Vega64 and it's still doing it with an NVIDIA GPU. Just curious if it's a problem with my monitor or if others have had this issue. It's very easy to see in NVIDIA's pendulum demo with Show Test Pattern enabled as the background will flash back and forth from dark to light gray. Standard Engine doesn't seem to have any issues, but of course it also has a much reduced range. C27hg70. I have the same issue with my gtx 1080ti. I had a fury, and while it worked without flickering, the monitor almost never started without user intervention (Fury was known to be temperamental). Standard engine is like 120-144 and even with the 1080ti I don't hit that in most of the games I play. What's the point of even including the option when this makes "Standard" utterly useless? I have a Viotek GN32LD that uses the same panel and F/GSync works so much better, but the massive smearing and motion blur gives me a headache after half an hour. I guess it's true that all the budget monitors with Samsung panels use binned rejects. edit: Experimenting with changing the low end of the range, and so far it seems increasing it from 48-144 to 75-144 for Ultimate has reduced much of the flashing and flickering. It may be problem with the panel?